Don’t miss Madrid’s world-famous Prado Museum and its surrounding hidden gems known only by the locals! Enjoy a special treatment and skip the entrance lines with priority access. Make the most out of your time and enjoy a private tour with your own professional guide! Discover the delights of Prado Museum and explore the hidden gems around it. Top up your experience with a priority-access ticket and local insights from your private guide. Meet your private guide at Plaza de Cibeles. Admire its attractions such as the legendary Cibeles Fountain, the gorgeous Cybele Palace or the beautiful architecture of Bank of Spain. Move on to Neptune fountain, be amazed by its beauty and listen to the local stories behind it. Did you know that the Cibeles and Neptune fountains are both extremely popular among the locals? Your private guide will tell you and your friends all the reasons why! Head to Retiro Park. Madrid’s popular park to relax, stroll and catch a breath of fresh air. Hear all about the park’s development and explore its avenues while your host tells you how the locals spend their free time here. Don’t forget to pass Madrid’s oldest tree and the San Jeronimos Church, where King Juan Carlos was crowned in 1975. 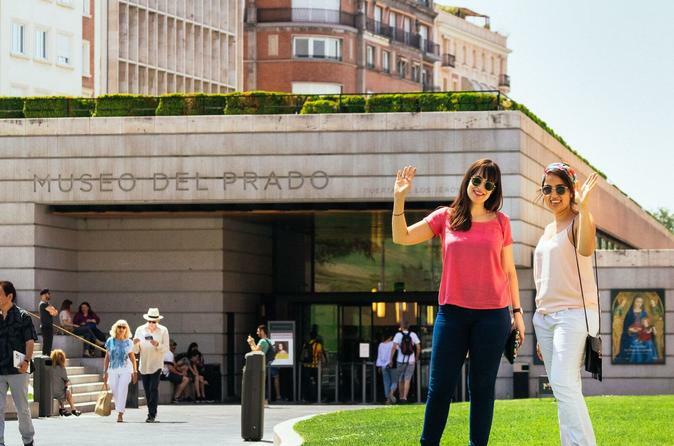 Next, visit the Prado Museum and get the most out of your visit with your private guide. He arranged skip-the-line tickets for you and your friends so head straight into the fabulous museum without waiting in line. The museum is one of the most important art museums in the world and includes artwork from artists like Velázquez, El Greco, Rubens, El Bosco and Goya. Learn about the museum’s history as you admire the collections housed in this building. Follow your private guide and get to know more about the sculptures, paintings, and unique styles. Discover the iconic artworks such as The Annunciation by El Greco, Las Meninas by Velazquez or the Family of Carlos IV by Francisco Goya. Get all the answers to your questions from your local guide, they are all art-lovers and history buffs. End your Prado visit inside the museum where you are welcome to stay after the tour. The Prado guided tour takes around 1-hour and you’ll cover all the must-see artworks.